Great American Steel Shake is a new version of our long-proven aluminum shake. Produced from top quality PVDF-coated G90 American-made galvanized steel, this product has the heavily textured shake look that turns any home into a show stopper. fully interlocking 12” x 24” panels have concealed fasteners which you will never have to worry about. Our three proprietary Cedar colors consist of a four-layer PVDF coating, sold under the names Kynar 500® and Hylar 5000® PVDF resin-based finishes. 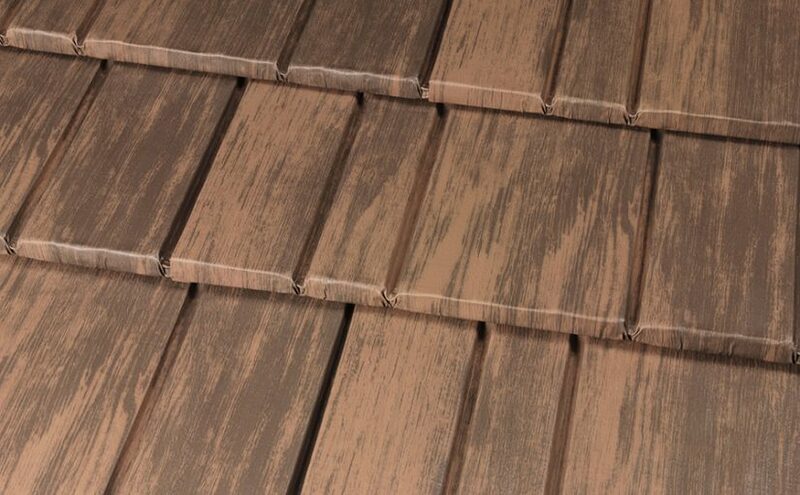 These unique finishes include a high definition woodgrain print that provides for light and dark areas on the roof. No longer does a metal roof have to be monochromatic, thanks to these coatings! The final layer of coating on these colors is a clear coat PVDF which provides greater film thickness for durability as well as enhanced UV protection for fade and chalk resistance. Roofs are not pretty places to be. They are constantly subjected to a variety of weather extremes from burning sun to freezing cold to rain, snow, ice, and even hail. Because your home’s roof is its main line of defense against the weather, it makes sense to have a complete roofing system that resists the elements. We provide our Lifetime / 40-Year Transferable Limited Warranty which is the industry’s strongest. This warranty is non-pro-rated for all owners of the roof and, should product failure occurs, it covers materials and labor for repair or replacement. The PVDF coatings also carry the industry’s most comprehensive fade and chalk warranties. Our PVDF finishes include reflective pigments for energy efficiency. By keeping heat out of the attic, air conditioning loads are reduced and energy savings occur. The integral air gap between the Great American Steel Shake metal and the roof decks acts as a thermal break, blocking conductive heat transfer. This behaves much like the space between two panes of glass in a thermal pane window. The energy savings for your home can be up to 25% or even more in some climates. Great American Steel Shake is Certified Premium by the Metal Construction Association through its Roofing Panel Certification Program. This intensive certification process allows for ongoing monitoring and auditing of our quality control procedures. Included in that are steps taken to ensure that our raw materials are all of “first” quality rather than the inexpensive secondary products used by some manufacturers. Our steps for quality ensure that you will not be leaving anything to chance. Every component of this roof – top quality steel, paint, coatings, and accessories – is manufactured in the United States. Great American Steel Shake protects your home with beauty and style while keeping America’s economy working strong!